Espresso coffee was invented in Italy, and the work comes from the Italian for “under pressure”. As the name suggest it is one of the quickest methods of making coffee, and is served up for drinking straight away. Espresso is also one of the strongest types of coffee, and is served up in tiny cups. When espresso is made in a coffee shop, the barista uses a very expensive industrial scale coffee machine which most of us are not lucky enough to have at home. So how can you recreate a good coffee shop style espresso in your own kitchen? There is a good range of coffee makers on the market which will make as good coffee as you will get in the coffee shops. When looking for a machine to buy there are a variety of factors to consider such as how many times a week you are going to use it, what your budget is, what sort of grinder you have and whether or not you’d prefer a fully automatic machine to do all for you. The place to go for advice is a specialist retailer where you’ll get one to one advice from an expert and have the opportunity to look around the different models and decide which one is the best for you. 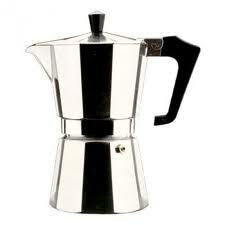 The best way of starting to make espresso for beginners is the stove top espresso pot, also known as a moka pot. These are also sometimes called Italian coffee pots and are the traditional and simplest way to make espresso coffee, quickly and without fuss. They are simple and cheap to buy, and available from a wide variety of retailers. They work by passing boiling water through the hot coffee and sit on top on the stove until needed. To make espresso in the pot, firstly take it to parts and fill the bottom section with water. Then fill the funnel part of the machine with ground coffee. Real coffee fans prefer to grind their own beans, but good quality ready ground varieties are also widely available and work just as well as freshly ground as long as they are stored properly and used while still fresh. Put the pot together and then place it onto the stove and switch it on. Once the water boils, the steam will come up through the coffee and the pot will fill with espresso. Then all that remains is for you to pour out the coffee into a small cup and sip on it Italian style, without milk and sugar. You could also heat milk and make yourself a latte or Americano. J2ME-based solution and database integration.